Liverpool's bid to sign Sevilla full-back Daniel Alves has stalled, according to the Spanish club. The Reds have formally tabled two bids for the 23-year-old but have yet to meet the asking price of around £12m. Alves is keen to move to Liverpool, but Sevilla president Jose Maria Del Nido said he wants the Brazilian to stay. "We're 15% away from reaching agreement in terms of what we want and what they are offering. Negotiations halted on Monday. This makes me happy," he said. Del Nido admitted that he had not convinced Alves that his future lay with Sevilla. But he added: "Sevilla doesn't want Alves to leave the club. "It is the player's desire to leave and the tempting deal they (Liverpool) have offered him has been the reason why we have had to sit down and negotiate." 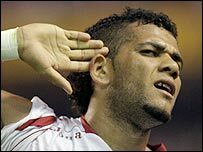 Brazilian Alves has been at Sevilla for four years now and impressed during their Uefa Cup success in 2006, most notably in the 4-0 demolition of Middlesbrough in the final.